Mass (Mass in Spanish) was written when the author was a student at the Royal College of Music in London in 1979. We can see in this work, a very simple and effective voices and harmonic structure movement: In this work already anticipates a very important formal aspect of the author's work in construction. This fundamental aspect will be developed in later works such as: Sextet No. 3 for woodwinds and strings, Trilce for orchestra, Two Pieces for Max for soprano and trio of wind instruments and love America for voice and low-baritone toolkit wind metals. This formal element is (seen at a basic level) in the use of very close intervallic distances between voices or instruments (minimum 2 voices), ie, the voices (or instruments) are related by intervals of second (minor and major). The version presented here is digital (midi). The pronunciation of the texts is not reflected in this version. Ave Maria It was written when the author was a student at the School of Music Jose Angel Lamas Caracas Venezuela in 1977. 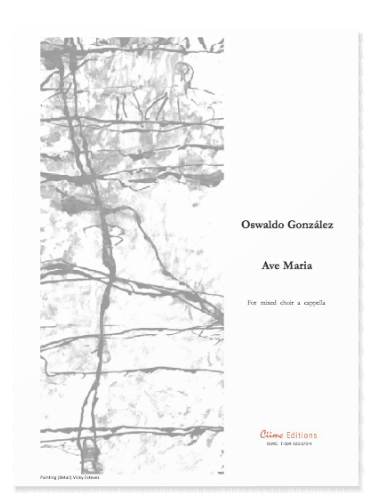 We can see in this work, a very simple and effective voices and harmonic structure movement: In this work a formal and very important aspect of construction is anticipated in the author's work. This fundamental aspect will be developed in later works such as: Misa for mixed choir, Sextet No. 3 for woodwinds and strings, Trilce for orchestra, Two Pieces for Max for soprano and trio of wind instruments and love America for voice and low-baritone toolkit wind metals. This formal element is (seen at a basic level) in the use of very close intervallic distances between voices or instruments (minimum 2 voices), ie, the voices (or instruments) are related by intervals of second (minor and major).